This article was first published in CoFounder No 10 in November 2017. Printful provides a platform for easy on-demand online printing, fulfillment and shipping. Its founders have built something bigger than Facebook (in Latvia, but still). It has never raised venture capital. Moreover, it is eyeing up an IPO in New York. 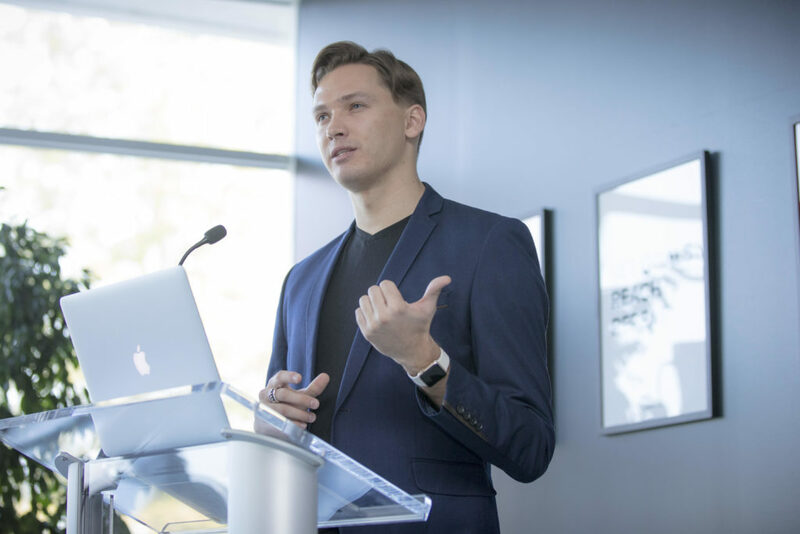 “If all the cards fall right, we want to be the first company from the Baltic states to go public in New York,” co-founder and CEO Davis Siksnans said in an interview. It just has to keep on growing to do that. Printful prints T-shirts and other merchandise for online e-commerce stores and provides a drop-shipping service for them. “Not necessarily every business idea has to be a giant leap forward in terms of innovation. You don’t have to be building flying cars,” Siksnans says. Like many stories of successful startups, Printful was born out of a problem with founders. It is one of the ventures of Draugiem Group founders Lauris Liberts and Agris Tamanis. Draugiem has made Latvia the only country in the western world where the most popular social network has not been Facebook. The success has enabled the team to search for many other businesses. Fast forward to 2012, when Siksnans launched, with Liberts and Tamanis, Startup Vitamines – a Shopify-based online store printing motivational quotes on posters, mugs, and other promotional products. “Lauris was physically printing these posters at his home in Los Angeles, California. At one time he wanted to start selling T-shirts. The problem was that a T-shirt is a thing that doesn’t really scale in a home environment,” Siksnans remembers. So the team looked for a good print-on-demand supplier. “It was really important that we did not have to send orders manually, but also quality and speed of orders had to be there,” says Siksnans. Printful was born as there was no such service available. “We naturally felt that if we had this need for a print-on-demand drop-shipping service, there were going to be thousands of others out there who had the same need,” Siksnans explains. The rest is history – Printful has recorded surging growth and now employs 325 people globally. Printful first built its presence in the United States and has now started to expand operations elsewhere. “The US market is so big and exciting, and now we are increasingly playing on a global stage. We are all having fun right now, especially at this fast growth stage,” he says. When looking back, the decisions are sometimes very obvious. When the team decided to focus on Printful, Startup Vitamines was growing and doing well. “It was the right decision to continue to experiment and put more resources into this novel new idea. It paid back in the end because Printful is now 100 or more times larger than the original idea,” Siksnans notes. HOW TO BUILD A TEAM FAR FROM HOME? Davis Siksnans speaks from experience, having started by reaching out to his personal network of American, Canadian and Australian Latvians. “If there was a fit, we hired them, and they helped us to build a very credible, trustworthy, sort of native speaker-like website and marketing around it, which really helped us.